Karen presented a circle of life exercise. It’s a circle filled with slices of pie. It’s not pie you eat! It’s pieces of your life representing spirituality, confidence, education, career, finance, health, physical activity, home cooking, home environment, relationships, social life and creativity. We were told to place dots in the pie slices how we felt we were doing in the different sectors in life and then connect the dots. I was so out of balance it wasn’t even funny. I thought to myself: how did this happen? I’ve done this exercise before and have never been this out of balance. I have reached my goal of owning my own business, yet I’m the most out of balance I have ever been. I realized I am accomplishing my dreams of providing people with good, healthy food and educating folks. I am fighting for the difference I wanted to see in the world. The bigger issue is although I was helping others, I forgot all about myself. This might be one of my biggest life lessons. So I’ve been reflecting lately on how do I find balance again. I wrote a pros and cons list of my life. I’m journaling again. Taking time to meditate everyday and move my body whether at work, walking with a friend, or a little yoga in my living room. Reminding myself it’s o.k. to set boundaries and be with my friends and loved ones. I’ve reflected on the circle of life and ready to walk a more balanced path. As a business owner of a healthy establishment, I want to share that life has many paths. Sometimes we stray off the path and become lost. There is still hope! We created Fresh Thymes not as the ultimate healthy food destination, but to meet people where they are on their own journey and educate along the way. Namaste. Jenn Adams, owner of Fresh Thymes Café, is originally from Illinois and grew up in a farming family. She understands the importance of supporting local farms. Her mission is to educate and provide quality local and organic food for the community. 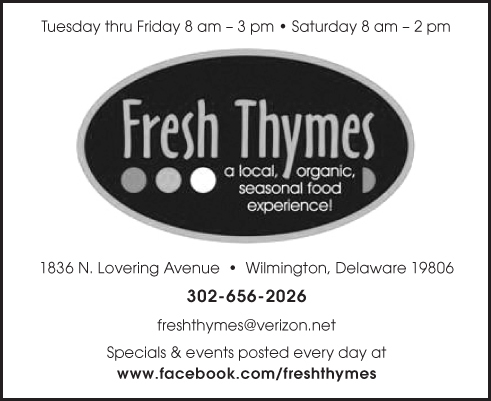 Fresh Thymes, a quaint cafe nestled near Trolley Square, Wilmington, DE provides a local, organic, & seasonal food experience. We also provide gluten-free, vegan, vegetarian, and omnivore options. We look forward to meeting you soon! More information can be found www.facebook.com/freshthymes. If you have not tried this wonderful café then you are truly missing a unique, wonderful food experience. The food is extremely fresh, and it is wonderfully prepared. I love the quaint atmosphere as well. Bring your friends and enjoy a wonderful meal.